Discussion in 'Classic Manual Cameras' started by connealy, Nov 10, 2004. While going through some of my wife's old family photo memorabilia recently I came across a yellowed negative/print envelope. Along with the Kodak promotional content, there was also the stamped name of my wife's uncle, Ralph, and a penciled notation, "Winston Churchill and Daughter". I put the negatives from the envelope in my scanner and, sure enough, there he was sans cigar, but sporting a homburg and bow tie. Something my wife said made me think that the picture had probably been made by my wife's father or uncle during Churchill's 1941 visit to the U.S. shortly after Pearl Harbor. However, there were some aspects of the picture that raised doubts about that time period. 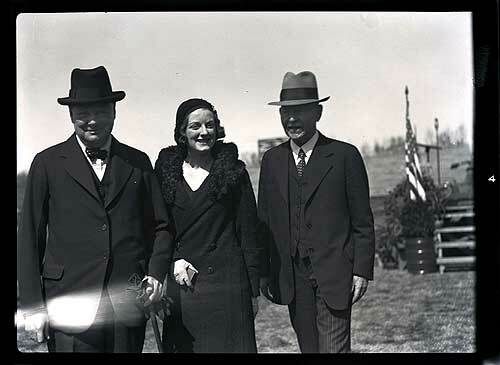 Churchill looked pretty young in the picture, the clothing styles looked earlier than '41, and the location didn't look like any place north of the Mason Dixon line in December. When I showed the prints to my brother-in-law last night he said he hadn't seen them before, but he did know some of the story. He was almost sure that the pictures were taken by his father, Lester, in the early '30s while he was attending Georgia Tech. I did a Google Search on "Churchill/Georgia Tech" and immediately turned up verification of my brother-in-law's recollection. 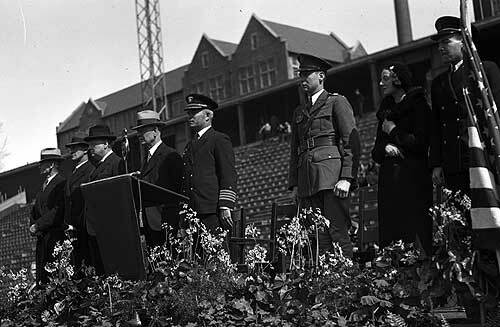 The picture was made in 1932 when Churchill was invited by the university to speak at a parade of Navy and Army ROTC cadets. This was during the ten-year period when the famous statesman held no office and mostly devoted himself to speaking and writing. His speech on that day dealt with his now well-known concern for military preparedness, a topic he would revisit many times later with FDR. The negatives were 4.25 x 3.25 inches with numbering on the short side. I don't know what type of camera produced them. The uncle, Ralph, is now in his 90's and living in Florida; it is possible that he will be able to verify whether it was he or Lester who took the shots and with what kind of camera. Here's a crop of the other negative showing more of the location. Churchill is third from the left. That's really neat; what an interesting find. I wonder how many photographs either Georgia Tech or the Churchill Library have of this event and if these would be of any importance to either one of them. If the film is very thin, it's probably from a film pack. They were still quite popular in 1932. That a four in the margins of the first negative means that probably it was in something like a Grafmatic, except that according to Graflex.org, no 3x4 Grafmatics were made. The sheet film holders could take up to 16 sheets of film, but I didn't think that they printed the number on. Still given the location (US) I would bet it was a press camera of some sort. Cool photos for sure. My favorite quote of Churchill's goes something like, "Representative democracy is the worst kind of government, except for all the rest." Wasn't 616/116film 3 1/4x4 1/4? My father had a Kodak folder of that size. I think it had a 4.5 tessar. I wish I still had it. Those are really interesting. You know, this is one of the very few photos in which Mr. Churchill looks relaxed and smiling. That in itself is significant. Good story and photos. Thanks for sharing. That is a very cool photo mike , I would contact the churchhill library if there is one. There are a lot of photos of him at Blenheim Palace north of london where he was born. I am glad you saved them . Can't be 118 or 124 roll film, since the roll films, if exposure numbered, it was always done in the side margin of the film. Plus, in 1932, I don't think anyone was edge numbering roll film. None of my pre-1950's roll film negatives are edge numbered. If the film is stiff, then it could be some sort of sheet film holder. But it would be very stiff. Note that the negative is almost certainly on a nitrate base, and that should be taken into consideration in storage. Segregate from non-nitrate negatives, ventilate, keep cool. It's from a film pack, which were numbered 1-12 in those days. Probably a Speed Graphic or Graflex. There is a Winston Churchill Memorial and Library site. I'd hazard a guess and say that they might be interested in getting a copy of the photos. Makes me wonder how many other unique photographs are slowly decaying in people's attics and basements..